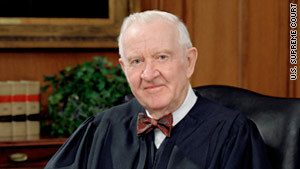 Retired Justice John Paul Stevens has been a powerful voice against the death penalty. Washington (CNN) -- Executions in the United States continued to decrease in 2010, with the 46 death sentences carried out representing a 12% drop from the year before, according to a report issued Tuesday. The 2010 figure is just over half the 85 people executed a decade ago in 2000. Meanwhile, 114 people were added to death rows around the country this year, just under half the number from 2000, said the report by the Death Penalty Information Center (DPIC), a Washington-based group that opposes capital punishment. While the issue of capital punishment can generate emotional political and public debate, the center's report suggested practical reasons for the decrease in executions. The capital appeals process can be expensive, causing many lawmakers to re-examine the financial consequences of pursing death sentences in a weakened economy, according to the report. Illinois officials reported $100 million had been spent statewide in the past seven years on death penalty prosecutions, despite not executing anyone in 12 years. "Whether it's concerns about the high costs of the death penalty at a time when budgets are being slashed, the risks of executing the innocent, unfairness, or other reasons, the nation continued to move away from the death penalty in 2010," said Richard Dieter, the center's executive director who wrote the report. It said 12 states carried out executions in 2010, most of them in the South. Texas led the country with 17 executions, while Oklahoma carried out what is likely the last execution of the year when John David Duty was put down Thursday. In Duty's execution, corrections officials substituted the first drug used in a three-judge cocktail with the pentobarbital anesthetic due to a nationwide shortage of the traditional sodium thiopental. His lawyers argued that administering the different drug -- widely used to euthanize animals -- was cruel and unusual punishment because it was risky and unproven in humans. For the past year, Ohio has used a single-drug method that had never before been tried on condemned prisoners in the United States. It relies on a single strong dose of sodium thiopental injected into a vein, while a separate two-drug muscle injection is available as a backup, officials said. The one-drug method has also been used to euthanize animals. The other 34 states where capital punishment remains on the books rely on a three-drug-mixture: an anesthetic, paralyzer, and heart stopper. According to DPIC, 40 execution dates were stayed in 2010, many over whether inmates had been given a full review of their claims. The Supreme Court is currently considering an appeal from a convicted Texas killer who seeks DNA analysis of evidence not originally tested from the crime scene, which he says will exonerate him. The justices will decide whether capital inmates have a basic federal civil right to have forensic evidence reviewed late in the appeal process. "This is a different lawsuit. It says: 'I'm going to file a lawsuit for my civil rights to be able to prove my innocence.' The question will be: Will that kind of be a backdoor way to getting at this critical question of whether someone might be up on death row or life in prison forever for a crime they may not have committed." A ruling in the case is expected in the first half of 2011. As for the high court, the conservative majority has generally turned aside requested stays of executions. But members of the bench from both the left and right remain conflicted over the future of capital punishment. Conservative justices -- led by Antonin Scalia and Clarence Thomas -- have chided lower courts for casting aside congressional mandates that death sentences be carried out without unnecessary delay. Liberal justices -- including an increasing vocal Sonia Sotomayor -- worry that states and the lower courts are not following high court precedent to ensure capital inmates get a full hearing of their appeals. The Supreme Court has again scheduled arguments in coming months on a range of capital appeal issues, which apparently would please retired Justice John Paul Stevens, a powerful voice against the death penalty. Stevens, who stepped down over the summer at age 90, wrote an essay this month in the New York Review of Books that lamented the continued use of capital punishment as "unwise and unjustified." "The finality of an execution always ends that possibility" that death row inmates may repent and have a positive impact on society from behind bars, he wrote. "That finality also includes the risk that the state may put an actually innocent person to death."